I am finally back where I can respond beyond an emoticon. I have no voice left. to the presentation night for the Dwayne (Charlotte Fullerton) McDuffie Diversity Awards show. The cold started in my chest the day before we left for the airport. Marsha and I were able to get on the plane on time, only to be taken off due to fog in Detroit where we had to make a connecting flight. 7 hours later we were finally allowed back on the plane. This meant when we finally did arrive in Detroit we had missed our connecting flight. We did not get into LA until 3am our time, midnight LA time. The cold had progressed so that my voice was now a rasp, that of a really old guy whose voice was threatened to silence. And that night, I would have to speak to the audience for Dwayne McDuffie and Charlotte Fullerton. My voice was gravel, churning in my throat. I had decided that I would wear a Black Panther T-Shirt under my button down shirt since it was opening night for the movie. I thought it would be a fun idea to start with a professed strip-tease and reveal the Panther underneath to the people. I hoped Charlotte wouldn’t kill me. Fortunately, when I did it, people laughed and chapped, and I raised my arms, from what I can see, so that I looked like a revivalist minister from a Neil Diamond song. Charlotte said it went over great, and I sighed relief. I had 3 panels to do for the Long Beach California Comic Con over the next two days. I had Ivan Cohen, who guided me to the panels and my table get me some DayQuil and slugged it down as the table was swarmed with people. Somehow most of them managed to hear me over the comic con medlee of blended voices. You know the sound if you’ve been at a big con. Over the next day and night I would meet with some of my favorite people. Dwayne and Robbin and Miles Turner. And then the next day do a 2 hour Black Panther Round-table Discussion with Ryan Coogler, Nate Moore, Joe Robert Cole, Ta-Nehisi Coates, Don McGregor, Christopher Priest. I woke up that morning with no voice! 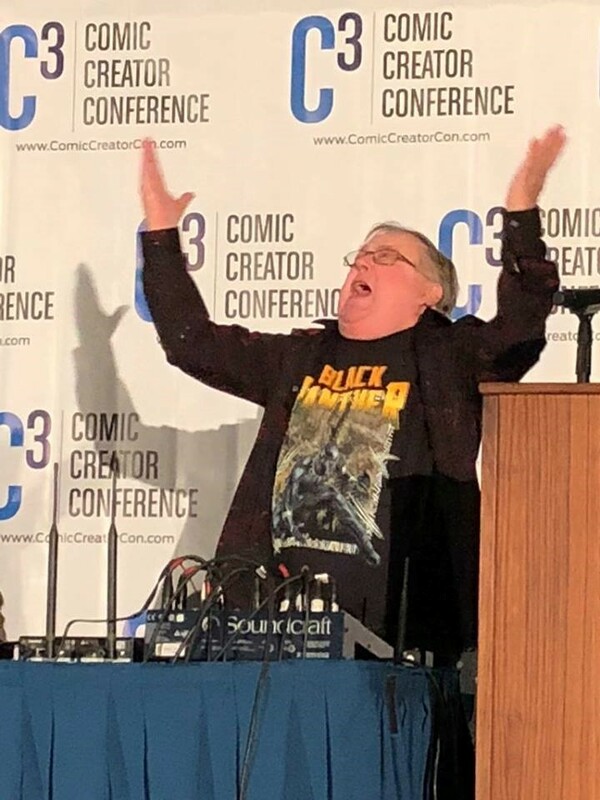 This was panic time, because if I could not speak, I could not represent not just me, not just PANTHER’S RAGE, but also Rich Buckler and Billy Graham. I was the last voice standing. But the voice was still, the gravel in my throat like congealed cement. Gradually, as the day progressed, the croaking frog voice came back. It was going to be One Froggy Evening. Looney Tunes fans will get the reference. That’s all for now, but I had to show-case this photo from standing up a strip-teasing the Black Panther for Dwayne McDuffie and me and the crowd. I’m glad Charlotte and the audience seemed to like it. I get a kick out of champagne…Wait.